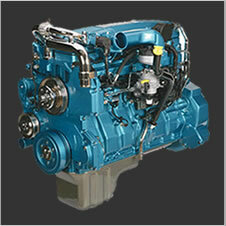 TEXA makes diagnostic tools for owner/operators, fleet/business owners and repair shops. Providing a range of top-tier diagnostic tests, cost-effective maintenance tools and innovative 24/7 remote diagnostic/monitoring solutions, which tool is right for you? Multi-brand diagnostic software rivalling dealer and OEM software, IDC5 is loaded with advanced diagnostic features needed by repair shops and mobile mechanics. The user-friendly interface helps users learn the tool to quickly complete their tasks. From reading and clearing fault codes through to advanced tests and configuration including PTO Configuration, Cylinder Cutout, Transmission Configuration, Aftertreatment Resets, etc. 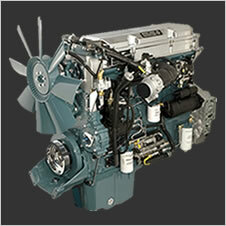 IDC5 diagnostic software is also available for Off-Highway Equipment, Marine and Powersports. 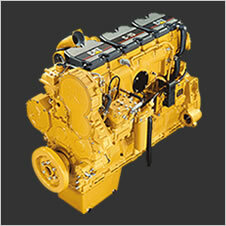 Looking for a tool to perform maintenance routines but don’t need advanced diagnostics capabilities? 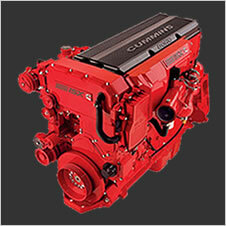 Quick Service can read and clear fault codes, adjust speed limiter settings and perform aftertreatment diagnostics and resets including forced DPF regeneration. Install the eTRUCK module for 24/7 access to the truck anywhere with cellular service. Monitor driver behavior and vehicle status, perform remote diagnostics including forced DPF regeneration. eTRUCK provides information for the Driver, Truck/Fleet Owner and the Repair Shop. eTRUCK Driver App – available for Apple and Android devices, the Driver App displays live data from the truck and has information to show the driver their behavior for actions like hard braking, sudden acceleration and distance covered. The Driver App sends information to the TEXA portal where Fleet and Repair Shop can see real-time status of the truck and perform remote diagnostics. Fleet Owner Portal – a web based tool so truck/fleet owners can see the location of their trucks, maintenance status, daily checklists, driver behavior and upcoming service appointments. Repair Shop Portal – a webs based tool where repair shops can monitor trucks, see maintenance status and perform diagnostic tests and resets. 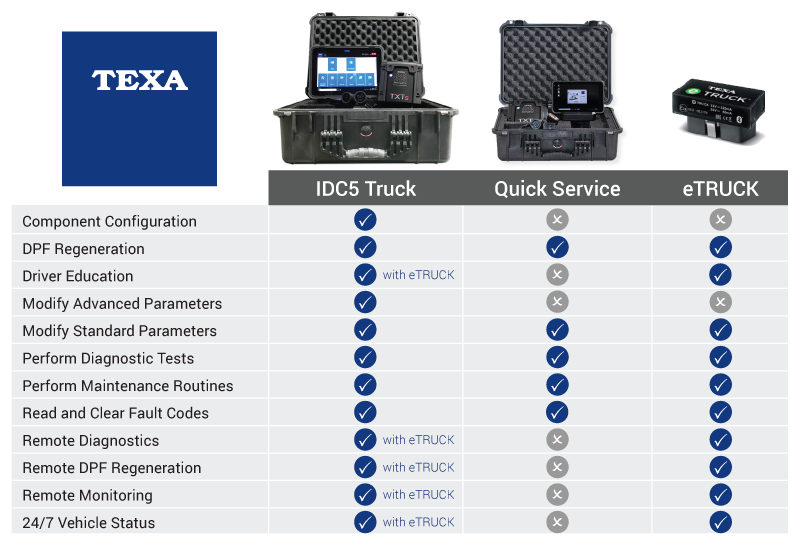 The repair shop must own a TEXA IDC5 diagnostic tool to use eTRUCK but all remote diagnostics are performed through the Repair Shop Portal leaving your IDC5 diagnostic tool free to be used within the shop. We’re here to help, call toll-free 1-855-326-8863 from 6:00am to 4:30pm Pacific (9:00am to 7:30pm Eastern) Monday to Friday.